3D Shapes - Build the Shape, Read the Shape! EDITABLE! 3D Shapes have never been so much fun! Students cut, fold and tape/paste the shape nets to create 3D shapes that they can engage with! There are 5 different options for each 3D shape including an editable version for you and your students to customize. On the sides of the shapes are examples of the 3D shape, the number of sides, vertices and edges as well as other information. 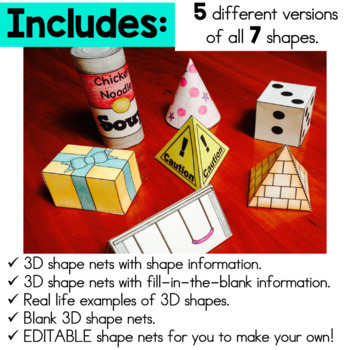 This pack also includes 3D shape nets that create real life examples of each shape as well as blank 3D shape nets and editable 3D shape nets. There are also 3D Shape nets with fill-in-the blanks for students to write the number of vertices, sides and edges themselves. 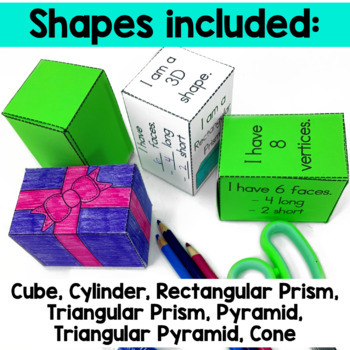 Students can write their own information on the blank 3D shape nets, or draw examples of the 3D shape. 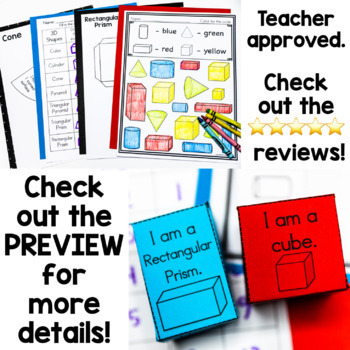 Bonus Pages: 4 3D shapes printable are also included in this resource. - A chart activity for organizing 3D shape attributes. - A cut and paste worksheet for curved surfaces/no curved surfaces on 3D Shapes. 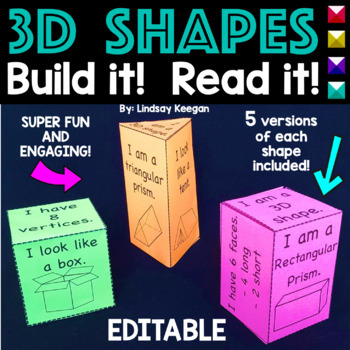 Enjoy your 3D shape building fun!